Good news during tough times. 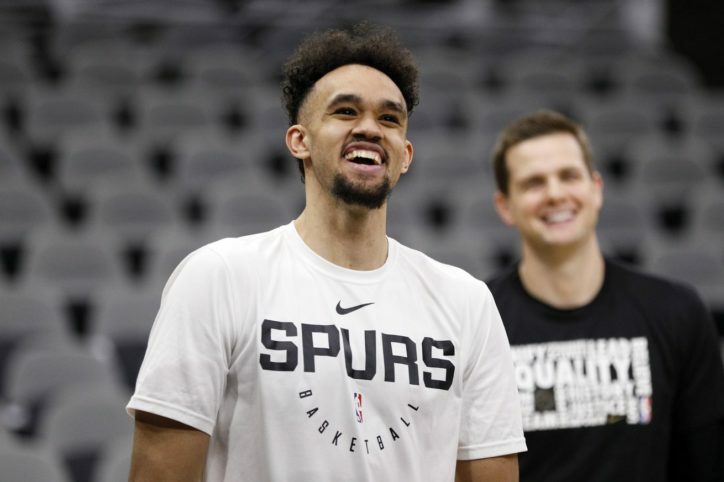 In a bit of good news prior to the Spurs loss to the Portland Trail Blazers — their third-straight to open the Rodeo Road Trip, and perhaps more importantly without Derrick White — Gregg Popovich revealed that he expects the second-year guard to return “pretty soon after the All-Star break”. White was diagnosed with plantar fasciitis in his right foot after the Spurs’ final home game against the Pelicans. It was initially reported that he would miss at least the next three games and did not travel with the team, but just about everyone knew that meant he would at least be out through the first leg of the RRT leading up to the All-Star break. Considering White was playing amazing basketball before the sudden diagnosis, and in the grand scheme of things is only expecting to miss five or so games (at least partially thanks to the All-Star break), hopefully that means it was caught early enough that it can completely heal and not become a chronic problem from him. He has arguably been the Spurs’ third best player over the last couple of months, and his production on both ends of the court is clearly being missed. The Spurs play in Utah on Saturday and Memphis on Tuesday before going on break. They will return on Friday, Feb. 22 against the Toronto Raptors before finishing off the RRT against both New York teams.